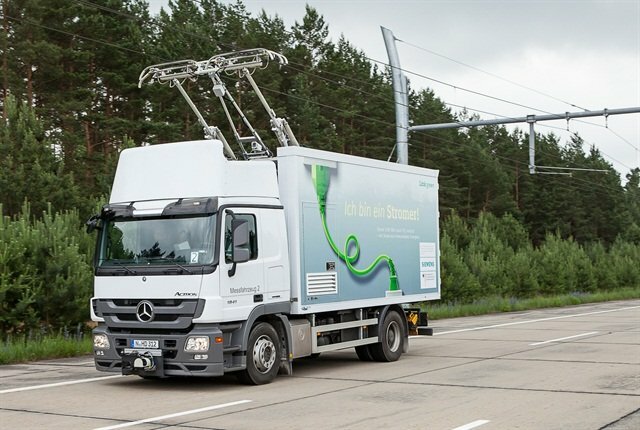 Will overhead catenary lines fuel electric/hybrid truck growth in some specialized applications? While competition from natural gas and declining crude prices have reduced attractiveness of hybrid and electric powertrain systems in commercial vehicles around the world, the long-term regulatory and energy outlook shows promise of a strong resurgence for these systems, according to a new study from Frost & Sullivan. The report offers a 2022 outlook compared to the year 2013, when the total global sales of hybrid and electric medium-duty trucks was nearly 2,200 units, while heavy-duty was nearly 300 units. By 2020, Frost & Sullivan projects that the global hybrid and electric medium-duty market will reach nearly 83,800 units. The emergence of low-emission and noise-free zones will create demand for pure electric trucks in pickup and delivery applications, according to the report. The global heavy-duty market is projected to reach nearly 50,800 units, thanks to fully electric trucks in refuse applications, and catenary (overhead electric lines similar to an old-fashioned streetcar) in specialized applications, such as between ports and inland intermodal hubs. OEMs will develop global hybrid vehicle platforms for deployment across different regions, while focusing on production of electric vehicles with local sourcing to facilitate economies of scale in high-growth markets. Urbanization: Rising congestion will lead to low-noise and low-emissions zones in crowded cities, as well as subsidies, tax credits and incentives to help make this happen. Advanced battery technologies: Improvements in distance per charge and energy density will dovetail with reduced upfront and lifecycle costs. Volatile fuel prices: They may be down now, but fuel prices will continue to go up and down, driving customers toward more fuel-efficient vehicles. Voltage standardization will provide synergy in electric components such as motors, inverters and batteries in the car and truck segment. Intra-city pick-up-and-delivery, supermarkets, logistics companies, and private fleets that haul lightweight voluminous cargo will present demand for MD-HD hybrid and electric trucks, says the firm. The global medium- and heavy-duty hybrid truck market is set to reach about 90,000 units by 2022. China, North America and Europe will contribute 85.4% of global volumes. Parallel hybrid architecture is expected to penetrate 81% of hybrid truck market in 2022 with series hybrid making inroads in specialized applications. The global MD and HD electric truck market is set to reach approximately 44,800 units by 2022. Chinese manufacturers such as Dongfeng, Foton, FAW and CNHTC are expected to top the global hybrid and electric truck market. Volvo and Daimler are expected to be the non-Chinese members of the top six in the market.